General George S. Patton’s words should be taken to heart in our daily lives, but are especially true when it comes to fishing. Research and reading are incredibly important, but no matter how knowledgeable you are, you can’t catch fish from behind a computer or magazine. When I set out the morning of August 5, 2011, I had a good plan: try to break my personal record for fish caught in a single day (57). If the first stop, Little Butte Creek, was any indicator, I had no chance. The two Brook Trout I caught there on my favorite small Rainbow Holographic Panther Martins were beautiful, but small, and I burned almost half an hour getting them to bite. 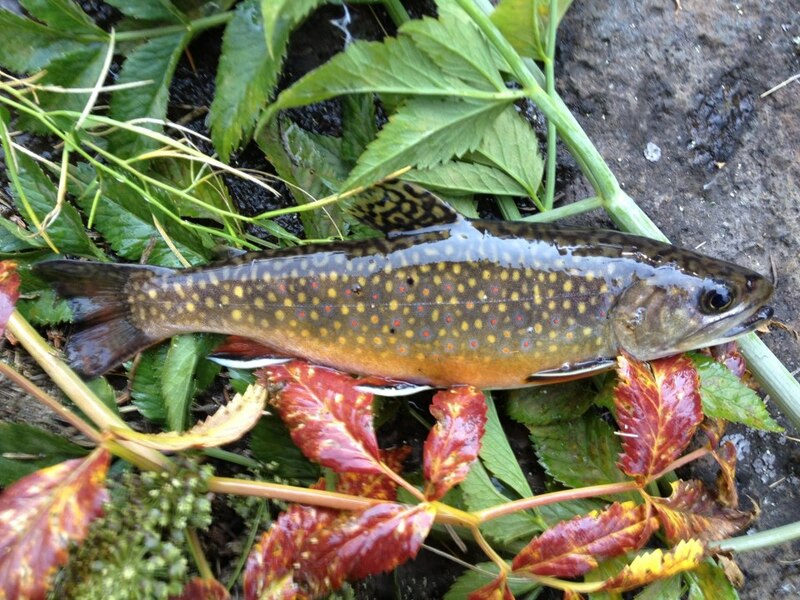 A particularly beautiful Little Butte Creek brookie. Day-Use Fees are commonplace at lakes throughout Southern Oregon, including at my second stop that day: Willow Lake. Unfortunately, for a broke college student who often didn’t eat on days he went fishing to account for the gas spent driving to and from the lake, paying to park was not an option. Since the fee is charged to park a vehicle on the grounds, and hikers and cyclists don’t have to pay, I always tried to find a free place to park and then walked in when possible. At Willow, I always parked on the Forest Service land just outside the gate on the south side of the road, then walked in to fish the corner of the dam, where the Yellow Perch congregate. You’ll cast in a crappie jig or worm and reel it in. Maybe one or two fish will follow and nip at it. The next cast, four or five. Then a dozen. That day, despite a small school of maybe 25-30 fish trailing my jig, I caught just three of the bait-stealing fish. It was now late afternoon, and my chances were not looking good. A few miles down the Butte Falls Highway, I stopped at Big Butte Creek, hoping the trout there would be more compliant. While I did catch two-of-three sport species found there (Coastal Cutthroat Trout, Rainbow Trout), I only caught one of each, putting my record still 50 fish away. Coastal Cutthroats often hybridize with Rainbows to produce “Cutbows,” but many of the fish do retain genetic purity. The fish pictured here is likely a hybrid. Driving up to Medco Pond is kind of anticlimactic. After driving 12.5 miles on the winding, dangerous Butte Falls-Prospect Road, you arrive at a gravel parking lot with no amenities. The setting is pretty, but it doesn’t look like the destination fishing spot it really is. 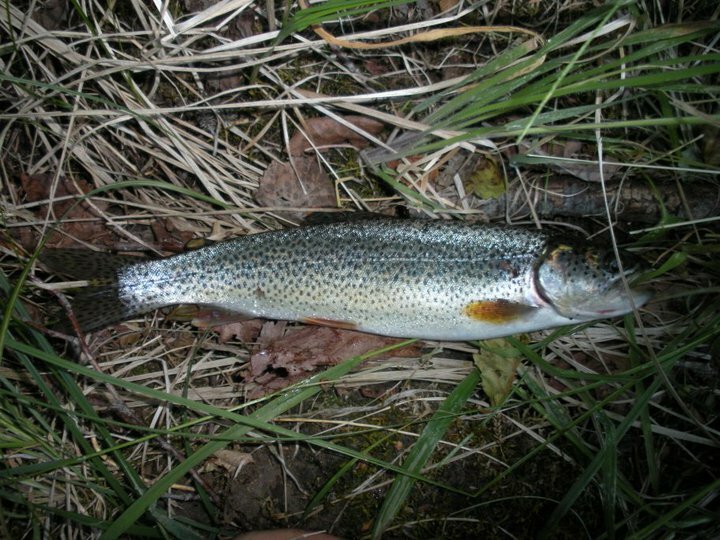 Most people fish along that gravel parking area, sitting in or near their cars while soaking a worm or Rainbow Power Bait for the skinny hatchery ‘bows that rarely top 10″ in length. On a good day, these folks might catch three-to-five fish apiece. Another group will fish with a worm or crappie jig suspended under a bobber. They will often do a little better, sometimes catching as many as 10-15 fish in a day. With 50 fish to go, I knew it was a long shot, but I also knew I didn’t fish like either group. Using a tiny ice fishing jig tipped with the smallest piece of worm I could pinch off, I caught fish after fish. Cast, let the lure sink, then reel up a few times and repeat. It was insanely effective. I caught 43 quite quickly, paired with the seven I’d already caught, it made 50. Then 57. I’d tied my record. Then it slowed. I was already breaking my personal record with each fish, but I was greedy. This close to 100, I pushed until the bitter end, hitting the mark just before dark. 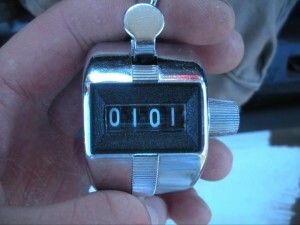 Pitch counters are a great way to keep track of how many fish you’ve caught. I used them for almost 10 years. I don’t know if it was because I liked the movie 101 Dalmatians, or maybe just because I was compulsive, but I decided to end at 101. It took me nearly 20 minutes to catch #101. Irritating, because there had been times that day when I’d catch five or six fish on as many casts but now that I wanted just one more … well, I really couldn’t complain. At the time, I used a pitch counter to keep track of the fish I’d caught in a day, and few things in life were more satisfying than clicking it that final, 101st time on that balmy August night. Read Hook #6: Highs and Lows.